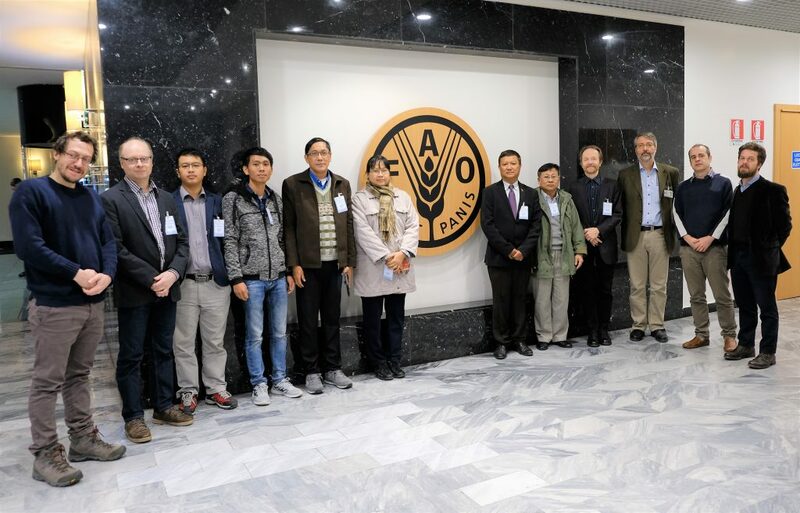 A technical mission of National Forest Inventory (NFI) Team from Myanmar Forest Department to the FAO Headquarters in Rome, Italy was undertaken from 26 February to 2 March 2018. Mr. Phyoe Wei, Range Officer, Planning and Statistics Division, FD. Mr. Franz Arnold, Chief Technical Advisor from FAO Myanmar, Mr. Pekka Hyvoenen, Project Coordinator, LUKE and Mr. Vesa Kaarakka, Forestry Advisor, Finnish Embassy were also participating in the meeting. During the mission, (1) Workplan for the planning phase of the NFI-NFMIS Project, (2) Scope and Scale of the new National Forest Inventory in Myanmar, (3) Sampling frame and overall sampling approach, (4) Implementation of permanent and temporary sample plots, (5) Sample Size for field measurements, (6) Field plot design and field methodology, (7) Alternative ways to access the plots in the areas of difficult access, (8) Data collection methods and data management system, and (9) Capacity building needs were discussed. Feasible options for socioeconomic data collection in the context of the project. Upload attachment (Allowed file types: pdf, doc, docx, maximum file size: 10MB.